The default localization is UK English. 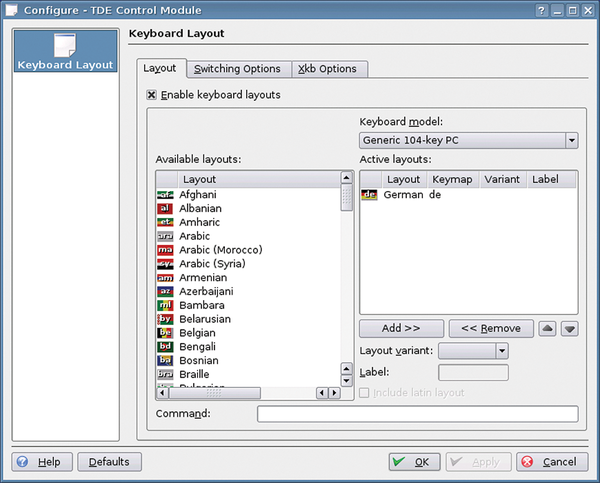 If desired, the language, keyboard, or both can be changed by selecting Internationalisation Options in the configuration program followed by Change Locale and Change Keyboard Layout. After completing the changes, the font and keyboard layout will match the new language. Settings for the graphical desktop will also need to be modified in like manner. The Trinity graphical interface in Q4OS makes it possible to change the localization options via Settings | Control Panel in the start menu. There, you should select the Regional & Accessibility option. In the fold-out submenu, you can select the Country/Region & Language options as well as Keyboard Layout. It is not possible to retrofit a desktop with localization files for another language after the desktop has been installed. This means that the TDE graphical interface, the menu dialogs for the applications that have been installed, and the folder labels will all appear in English. Programs installed later will appear completely localized in the desired language (Figure 3). Figure 3: Not yet perfect: The German language setting in TDE. Unlike many other lean distributions, Q4OS on the Rasp Pi also comes with a great deal of installed software in the conventional menus. However, large applications are not present. In addition to the KDE3 programs that are delivered together with the graphical interface and integrated into the TDE fork of KDE, the user will for the most part find lean applications after the first installation is complete. For example, Q4OS has four web browsers, including Dillo, the Gnome program Epiphany, Konqueror, and NetSurf, which is the fast Gtk-based browser. Programming tools and several shells have also been built in as part of the basic packages. Even Midnight Commander has found its way onto the system for use as a speedy file management tool. If you want to use superstars like LibreOffice on the mini-PC, you need a functioning Internet connection. Q4OS includes two different graphical installation routines, which both rely on APT package management. 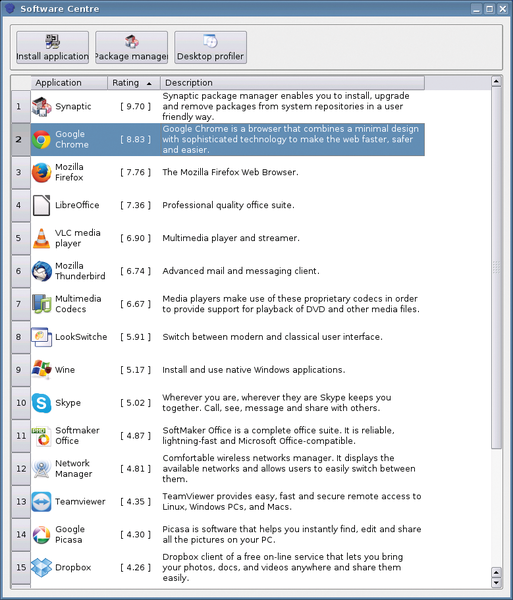 Additionally, Q4OS has its own graphical interface with the Software Centre. This interface allows the user to put selected applications on the bulk storage device using just a few mouse clicks. The interface is found via the Programs | Accessories | System | Q4OS Software Centre - Install Applications menu option (Figure 4). To integrate an application listed there, highlight it with a left click and then initiate the installation with another mouse click on the Install application button at the top left of the window. An easy-to-follow progress dialog then opens. Figure 4: The Software Centre lets you put several applications on the Raspberry Pi with just a few mouse clicks. It became apparent during testing that not all of the applications listed in the Software Centre were suitable for use on the Raspberry Pi. For example, a message interrupted the installation of the Google Chrome web browser saying that there was insufficient hardware support for the SSE command set. Chrome uses SSE commands to display multimedia content, and these require at least Pentium III Intel processors for implementation. In other words, the Rasp Pi does not possess the necessary capabilities. However, other dependencies, such as installation of the Java Runtime Environment when LibreOffice is called, are automatically completely resolved via the repositories. Checking out the software archive listed in Synaptic is recommended because the selection of software in the Software Centre is very limited. Although many proprietary programs can fill the void, many open source software alternatives are also available. You will find the graphical package administration tool in Q4OS in the Programs | Accessories | System | Synaptic Package Manager entry. Once the package source update is complete, Synaptic lists about 38,000 packages. These include libraries, documentation, developer packages, and run-time environments. Because the software inventory is based on the Debian archives, it is even possible to equip Q4OS with exotic applications.